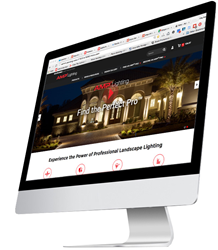 AMP® Lighting, a direct-to-professional manufacturer of landscape lighting products, announced today the launch of a new resource-rich website (www.amplighting.com). The site targets two groups: Authorized AMP® Professionals and homeowners (their prospective customers). Information for homeowners is on the public side of the site, while online purchasing and sales support are accessed through secured login. In addition to offering lower prices to its customers, AMP® Lighting provides its professionals an e-commerce site in a password-protected environment. The pros can place orders online 24/7, access their order histories and wish list, and track orders based on purchase orders and projects. AMP® Lighting takes advantage of modern efficiencies in every stage of its operations. The company owns three fully stocked shipping facilities to ensure delivery in one to three days. In-house lighting specialists are on hand to answer questions 7-days a week. And, the company is fully staffed with lighting experts engaged in an aggressive product development program. AMP® lights are among the most durable, reliable, and advanced in the industry and carry lifetime warranties. The website, itself, offers impressive support to the authorized AMP® Professional. When an AMP® Pro logs in, a wealth of tools and resources become available. These include templates (to create project drawings), proposals and contracts. Also available are articles that range from simple instructions in the use of color filters to advanced goal setting approaches to lighting design. To become an authorized AMP® Professional, applicants are screened for their relevant skills and experience. Once approved, the AMP® Pro can purchase products through the website and receive project leads. AMP® Lighting designs, manufactures, and distributes advanced and durable landscape lighting products. The company’s focus is serving the lighting professional with easy ordering, fast shipping, hassle-free warranty protection, and providing uniquely effective sales and marketing resources.